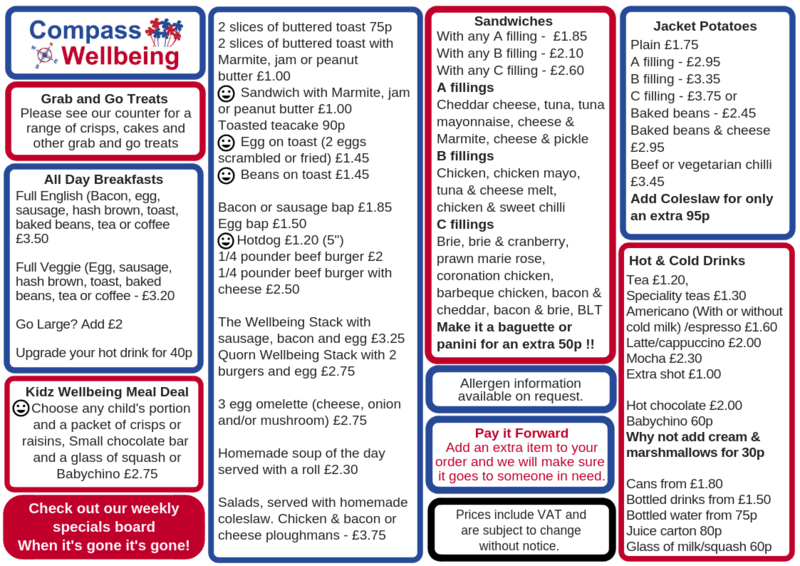 Visit our Compass Wellbeing Café, serving a range of hot and cold refreshments, light meals, snacks and confectionery. Browse our menu below for our full range of goodies. We can cater for those who need gluten free, dairy free and other alternatives to suit your dietary needs. Our Café is fully accessible, light, bright and airy. An ideal place to meet friends or colleagues or hold small business meetings. Free Wifi available throughout. CALL NOW on 01823 475250 TO PLACE YOUR ORDER! We're open every day except bank holidays. “Pay it Forward” - Someone once said "We can't help everyone but everyone can help someone". Poverty can often go hand in hand with social isolation, anxiety and depression. Participating in normal daily activities, such as visiting a cafe, can help to combat this. Compass Wellbeing invites our customers to purchase and donate a "Pay it Forward" item from the menu. These items will be then be issued in the form of vouchers to our neighbours at Taunton Foodbank, who in turn will choose those who can benefit most from the opportunity to visit our friendly, welcoming café.